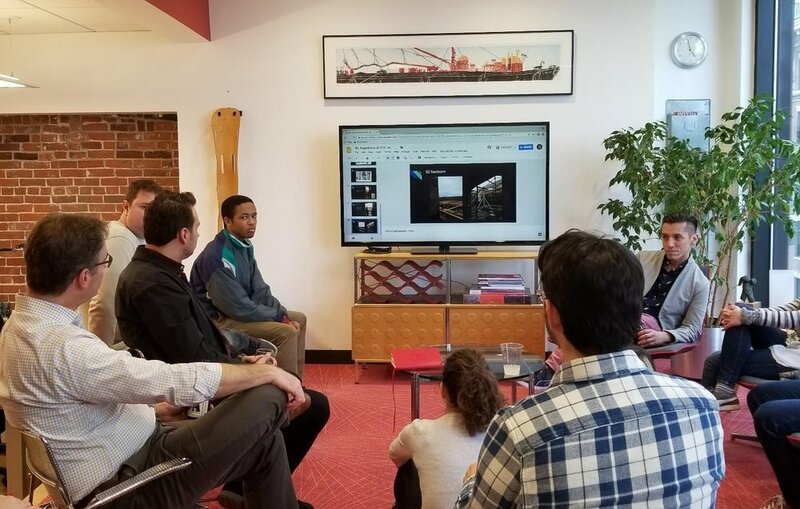 Here’s an inspirational story about Takel Challenger, a returning Designery student who came to us at the guidance of his social worker, Lemuel Mills of Tech Boston Academy, in the spring of 2017! Takel Challenger’s “journey to voice” through the Designery program is one of transformation. Before enrolling in the program, Takel had found it difficult to open up to others because of traumatic experiences in his childhood. He became extremely nonverbal and lacked the social skills that would allow him to interact with his peers and teachers. Despite coaching and support, Takel still lacked the ability to fully develop his skills. It was a growing concern for Lemuel Mills, his school based social worker/therapist. Mr. Mills searched for academic and after-school employment programs that yielded some results, but it was clear that Takel required a different kind of environment. Takel then applied to the Designery program last spring with the help of Mr. Mills. During the workshop and interview, Takel was very nonverbal, quiet, and did not demonstrate the willingness to engage with others. He struggled to elaborate in conversation during the interviewing process, but Mr. Mills did not give up. He was Takel’s strongest advocate. “It was challenging therapeutically because he is not necessarily overly responsive, so in trying to gain a foothold, I began to observe what he was interested in. He created some musical pieces, and I noticed that he liked to draw. I found out about the Designery and I guess the rest is history, because it has been very successful and impactful in regarding Takel's growth,” Mr. Mills told us. Group Photo, Spring 2017. Takel pictured in front with maroon sweater. Takel successfully enrolled in the program and finished his internship and returned to the Designery in the summer, fall, and this year. He made tremendous progress and developed his social skills, equipped himself with the relevant designs skill, and gained exposure to a professional work environment. “It was something that I always wanted to do. I went to an architecture firm to experience what they do in design, so that I could explore rather than just saying I want to do this. I wanted to see how they worked, wanted to see the whole process,” he told us. The opportunity at YouthBuild Boston proved invaluable to Takel’s development. At the Designery, he was able to work on his public speaking skills and was able apply himself through team communications. He was confident in his conversations with others and was able to express his ideas and opinion in a clear and concise manner. “I have a fond memory of struggling to present [in front of people], in some ways it makes me want to become better. No one gave me specific instructions, I just spoke from my mind and was able to explain the whole process,” he recounted about his own personal growth experience. Now a veteran intern, Takel acquired sufficient design-based skills to qualify for our Track 3 internship. Silverman Tyrkowski and Associates offered to host Takel as an intern in the spring. During his internship, Takel performed a variety of tasks, including site measures, construction meetings, production work, and digital modeling. It was clear that the experience was instrumental in Takel’s personal development. This summer, he is completing a full internship with Haycon Inc. and will continue his pursuit of design in the field of graphic design at Bunker Hill Community College, where he is enrolled to study graphic design in the fall. We could not be prouder. Presentation at Silverman Trykowski and Associates, Spring 2018. The Designery program provides a safe after-school learning environment for students like Takel to nurture and develop social and interpersonal skills and gain technical design skills. Takel’s journey is what the Designery program and other programs at YouthBuild Boston aim to foster: a personal transformation that will equip young people with the essential social, vocational, academic, and life skills necessary to navigate a positive pathway to self-sufficiency and neighborhood responsibility. “I call Takel’s process ‘the journey to voice’ and you can tell from his entry point in the program to where we are today that there has been significant shift in his personal confidence as well as in his level of personal agency,” remarked Mr. Mills. We wish Takel the best of luck as he ventures forward in the coming years, and thank our partners Silverman Trykowski and Associates, and Haycon Inc. for their ardent support. We plan to share more inspiring stories like this on our blog to you give an insight into the lives of our remarkable students. Please make sure to sign up for our mailing list and follow us on social media for more. We look forward to keeping you connected. For more information on our Designery program, please click here. All photos from Alex Ho, YouthBuild Boston.